This is the first of three scarves that I will hopefully get to make for my sister in law, Elizabeth. I was having trouble deciding which yarn to use, so she chose her own and ended up giving me enough yarn for three scarves. Several false starts which then had to be unravelled resulted in this being more time consuming than I had planned. Unravelling this particular kind of acrylic yarn is difficult because the fibre snags often, which slows the process further. 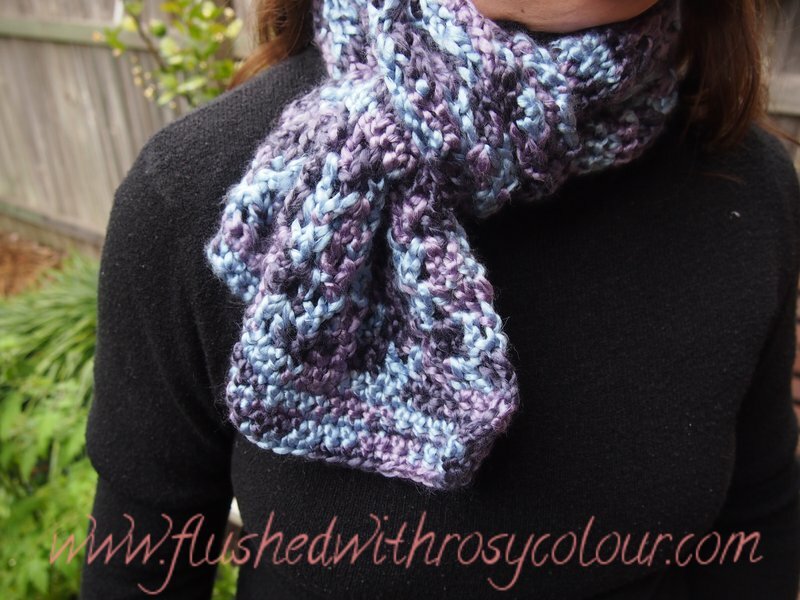 I was having trouble determining the width of the scarf, because I only had 200g of this colour. Normally 200g would be plenty for a generously sized scarf, but the ply of this is quite thick, possibly a 10 to 12 ply. This made the stitches thick and the scarf shorter than if an 8 ply had been used. This shiny acrylic has a beautiful sheen and is soft and silky to work with, its a lovely variegated colour that in the end results in a nice thick, soft scarf perfect for the cooler months. This scarf ended up being 8 inches thick and 36 inches long, or 20cm by 140cm. Elizabeth's Scarf #1 modelled by ... me. 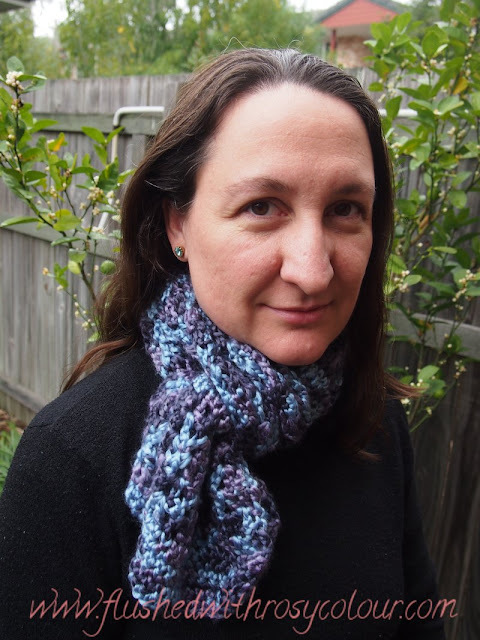 Elizabeth asked the scarf be thick and warm, but we also both thought a shell stitch would be pretty. For this scarf I decided to alternate a shell pattern with thick sections of sc and dc. I began with 3 rows of sc, then 5 rows of shell stitch 2 ch, sk 1, dc, sk 1 (dc 1 ch dc, sk 2) repeat for a total of 7 times, sk 1, dc, dc, turn (next row cont. except (dc 1 ch dc) into ch sp). For the next thick section I did (3 rows of sc, 1 row of dc) repeat for a total of 2 times, then 3 rows of sc. Then I repeated the shell section and the thick section. For the middle part of the scarf I did a long shell section of 22 rows. Then I mirror imaged the first end of the scarf for the other. Finally, I had an extra bit of yarn left at the end, so I did 5 rows of sc instead of 3 like at the beginning. All this with a 7mm hook makes this a very thick scarf just long enough to fold the way Elizabeth likes. I do hope she likes this scarf, it took me several hours to make!